The book considers the London theatrical culture which took shape in the 1570s and came to an end in 1642. - Places emphasis on those plays that are readily available in modern editions and can sometimes to be seen in modern productions, including Shakespeare. - Provides students with the historical, literary and theatrical contexts they need to make sense of Renaissance drama. - Includes a series of short biographies of playwrights during this period. - Features close analyses of more than 20 plays, each of which draws attention to what makes a particular play interesting and identifies relevant critical questions. 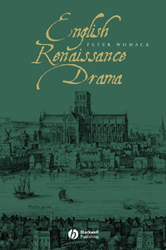 - Examines early modern drama in terms of its characteristic actions, such as cuckolding, flattering, swaggering, going mad, and rising from the dead.